"It's a place where you really feel on the limit and that's pretty awesome in an F1 car." 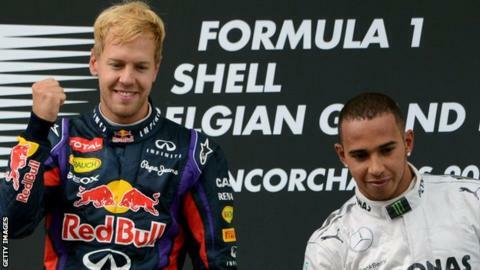 That was Lewis Hamilton's take on the Belgian Grand Prix in 2011. Back then, he was entering his final years with McLaren and only one championship trophy nestled in the cabinet. As the summer break draws to a close and the second half of the season begins, the Briton holds a 24-point lead over rival Sebastian Vettel and has a fingertip on a fifth world title. One of the most historic circuits on the calendar, the majestic Spa-Francorchamps is the perfect setting for battle to reconvene. Long straights mixed with the challenge of fast, sweeping corners, this track located in a valley of the Ardennes mountains is as picturesque as a wish-you-where-here postcard, yet as brutal a test as any Formula 1 driver will face. One year ago the roles were reserved between Hamilton and Vettel as the title battle rocked up in Belgium, with the German flying high with a 14-point advantage after victory in Hungary. But it was the Mercedes man who seemed most recharged after the holiday recess. Equalling Michael Schumacher's career record of 68 pole positions was the first strike, then a tense afternoon of cat-and-mouse on race day ended in a Hamilton win. Ferrari's Kimi Raikkonen could be one to keep an eye on after five consecutive podium finishes since the French Grand Prix in June. He also has the honour of being joint third in the all-time winners' list at Spa, with four victories. Is it time for the Iceman to step in and shake up a two-horse championship race? One of the most memorable F1 races ever - the 1998 Belgian Grand Prix - is 20 years old this month. You can read all about the rain-soaked carnage, pile-ups and bust-ups of that eventful day here. Out of the 22 drivers who started that day, only eight were classified finishers. We want you to name those drivers. There are two minutes on the clock to get guessing on this one. Who finished the Belgian GP in 1998? Belgian Antoine-Joseph "Adolphe" Sax invented the saxophone in the early 1840s. Although the popular instrument didn't immediately impress his peers, the musician also went onto to create the saxotromba, saxhorn and saxtuba. The Smurfs hail from Belgium. Comics artist Peyo came up with the original concept in 1958 after he couldn't remember the word for salt, so instead jokingly referred to it as "schtroumpf." "Les Schtroumpfs" was translated to "The Smurfs" for the American audience. Belgium's dense road network is visible from space. The glowing highways have near-total streetlight coverage, with around 2.2 million bulbs illuminating the roads. The highest point in Belgium is smaller than the world's tallest building. The Signal de Botrange on the High Fens plateau is 694 metres high, 134 metres shorter than the tallest building in the world - Dubai's Burj Khalifa - which stands at an impressive 828 metres. All times BST and are subject to change at short notice.